I received an email recently from my good friend, Chris in Florida. He asked me a question that I get a lot from our readers. Out of all the questions I receive, this is odddne I get the most often. What should I eat or drink after a workout? Since I just came back from a workout myself, I thought I would take the time to answer this for you today. I want to give you what I drink post-workout to help speed muscle recovery and give my body much needed nourishment. So why is there so much conflicting information on what to drink post-workout? Here’s the deal… everyone’s body is different. As you make lifestyle and dietary changes, you will find that you may not necessarily respond the same way as your friends or other fitness moguls you’re following online (myself included!). This is because we are complex and intricate beings and we all come from different ancestors and backgrounds. Yes there are basic nutritional principles that apply to everyone, but there are also a lot of things that are different for most people. Some people thrive on a vegan diet. Some people thrive on a paleo diet. Some people make their own diet that is pretty different than everyone else’s and they do great eating this way. I was vegetarian for one year and although is was healthy and I liked it, I couldn’t keep weight on. I dropped all the way down to 150 pounds. For some reason, my body didn’t want to build muscle the way I can on my current diet. But look at Mr. Universe… that man is the size of a buffalo and he lives on a strict vegan diet! What I’m trying to say is this: be sensitive to your body and honor it’s needs. If you don’t feel good or you’re not getting the results you want, experiment. Figure out what works for you and commit to it. Don’t think that your body is going to react the exact same way as someone else’s. In the meantime, this post-workout protein shake is great for just about everyone and I would encourage you to give it a try. It’s packed with some of my favorite ingredients. So what in my post-workout protein shake? It is really important to get a substantial amount of protein after you finish a good workout. Although portions of macros vary drastically based on gender, activity level, body composition (lean mass vs. fat mass), and age – GENERALLY speaking a great aim for grams protein is 20-25g for women and 25-30g for men. I like to use Garden Of Life RAW Organic Protein Powder. Almond butter is another good source of protein. 1 tablespoon of almond butter contains as much protein as a tablespoon of beef! Almonds are also an excellent appetite suppressant for those of you trying to lose weight. Almonds are also one of the most nutrient-dense nuts you can find. They are high in fiber, calcium, potassium, magnesium, vitamin E and healthy fats. Studies have found that almonds and almond butter help to lower blood pressure by reducing resistance/build up in the blood vessels. After a workout is a wonderful time to consume carbs because at this time your body is more likely to use these carbs as muscle glycogen rather than store them as body fat. So if you are trying to lose weight, put the bulk of your daily carbs in your post workout smoothie/meal. Glycogen is found in your muscles and is a chemical form of carbohydrates. These are used during a workout and should be restored soon afterwards. Carbohydrates are also important in order to help your body properly absorb protein. This is called protein synthesis. 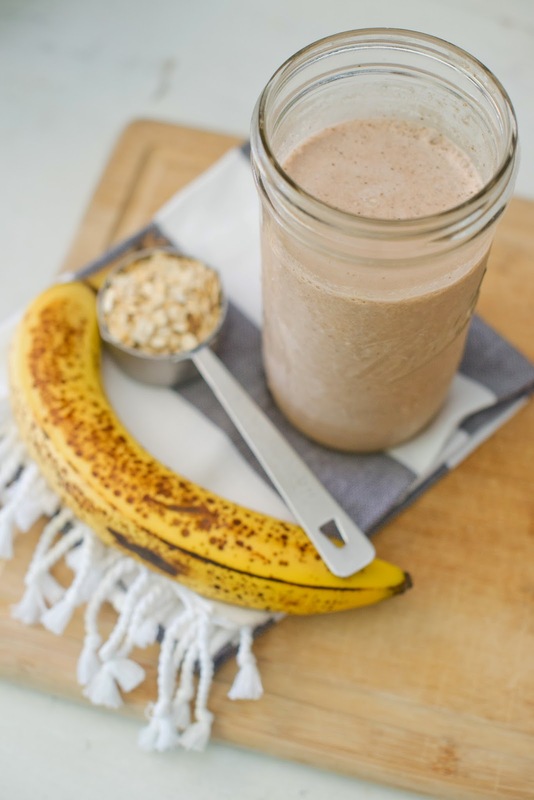 I love adding bananas into my protein shakes because they help make it creamy and delicious. Bananas are good for a number of reasons; they give you good carbs, they are packed with vitamins and minerals like fiber, copper, biotin, potassium, vitamin B6, manganese and vitamin C, they help with blood pressure regulation and are great for digestion. Spinach packs a powerful nutritional punch. It contains a TON of vitamin K which is important for circulation, natural blood clotting and bone health. It also has generous amounts of vitamin A, manganese, folate, magnesium, iron, copper, vitamin B2, vitamin B6, vitamin E, calcium, vitamin C, potassium, fiber, phosphorus, zinc and even a little protein!! Spinach also has some of the highest levels of disease-fighting phytonutrients found in the vegetable kingdom. Researchers has discovered over twelve different flavonoid compounds in spinach that have anti-inflammatory, antioxidant and anti-cancer properties. Basically, you can’t go wrong with spinach, which is why I add a big handful to my post-workout protein shakes. Why not throw a little extra chocolate into your protein shake? Raw cacao is a pure form of chocolate that is free of any extra harmful ingredients. It’s believed to help with focus, reducing fatigue, improving heart strength and cardiovascular health, treating of kidney and bladder disease, improving digestion and increasing longevity. Raw cacao has potent antioxidants called flavonoids. These neutralize free radicals in the body that are the cause of many diseases. The flavonoids in cacao also lower bad cholesterol, decrease inflammation and may interfere with cancer development. Blend all ingredients together and drink asap after coming home from a workout. Post-workout is a great time to show your body some love! As long as you get a good dose of protein along with some carbs in your post workout drink, you can mix up the recipe to make it your own. Fill your body with the best ingredients and you will get the best results! When you love your body and it will love you back.